With over 20 years of experience in RV sales and consignments, Jeff Rollins offers quality customer care while listening to his customer desires and needs when they are purchasing a recreational vehicle at J & J RV. Jeff: "We're the little guys - we try harder to please our customers." With over 17 years of experience in recreational vehicle maintenance and service, Joe Thibedeau has the knowledge to diagnose and repair any problem you are having with your recreational vehicle quickly. Joe: "I listen to what our customers are telling me, and get the problem solved right the first time for them." Escape the daily grind and connect with the things that really matter like enjoying good times together with family and friends. The Rockwood pop up camper takes care of the details - all neatly packaged into one incredibly functional unit. Every component works together to give you the best vacation times possible. The Roo's comfortable and pleasing accomodations let you kick back and enjoy family camping like you never have before. When the weekend comes and you're ready for adventure, Rockwood rises to the challenge. Rockwood travel trailers and 5th wheels turn every outing into a party. These fun-inspired units are designed with family-friendly features that make your time together a celebration. Building RV's of the highest quality for over 15 years. With putting our emphasis on quality, and keeping a keen eye on market trends, Travel Lite RV has grown over 300% in the past 3 years alone! 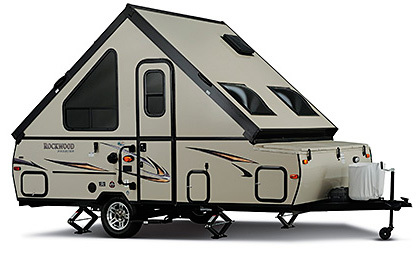 Travel Lite RV's products include our extensive line of truck campers, idea travel trailers, and our all new COBBLESTONE line of ultra high-end travel trailers. Pop-Ups, Hard-Side, Super Lites, and Full-Wall Slide-Out units available... needless to say, we are THE truck camper specialists! An innovative unit both in amenities and design. This ultra-lite product features standard features that most brand call options! The Hard Side tent camper brings a smooth, fiberglass vacuum bonded exterior with quick, easy set up, while retaining the towing and storage advantages of the Premier tent camper. Making it the perfect product for your camping adventure. We wanted to take this opportunity to personally thank you and the "guys" for a fantastic buying experience. We believe that the Rockwood trailer is perhaps one of the finest on the market today and we can see why you chose to sell this brand. Everyone was very kind and courteous and explained everything in great detail. The "after sale" service and assistance that you offer is second to none. any potential customer you get should really think twice about buying from some of the "bigger" dealers or where they think they are getting a better deal. The "no-nonsense" approach to your pricing takes all the guess work, hassle and confusion out of the deal and is one that we really appreciate. Your care and attention to your business coupled with a great product is an ideal situation not only for you but for the customers you service. Thank you very much, we will enjoy the new Rockwood for many years to come, we wish you continued success.